In Hawaii, I needed to clear up the fuel problem I had from Pago Pago. There was a mechanic on Maui who knew 210s very well. I called and and he said I could fly over that morning. A quick and pretty trip to OGG, then we cleared all the screens, pulled the sumps and inspection ports on the cabin tank, pulled and cleaned the injectors, checked the flows, and then reassembled everything. A test run was fine, then I flew back to Hilo at a low altitude, whale watching and enjoying the scenery. The plane ran noticeably better, and seemed to make more power. I went back to the hotel till the next day. I packed a big box with clothes and unneeded items, sent it home UPS, saving 65 pounds. 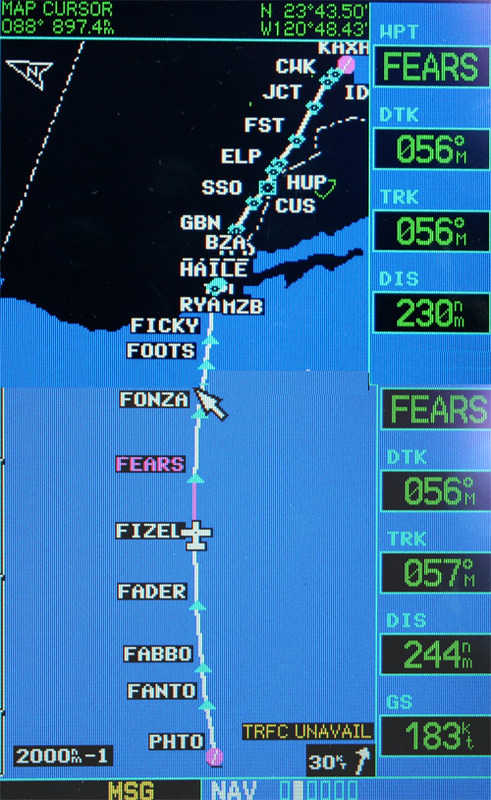 It was earlier than planned, but I was helped with the decision to head onward by enticing tailwinds and clear skies. I fueled up the plane, arranged for after hours USDA inspection on the plane, called in my flight plan to the 1-800 number, so convenient. I filed initially to Tucson, the weather in Houston unpleasant. I was up at 4:15, at the plane at 5:30, retopped the tanks, checked all the transfer pumps, paid the inspector his fee, and taxied out to depart at 6:25 local. The sun was glowing below the horizon in the east, and the weather was crystal clear. I took off on 8, cleared direct to FANTO 250 miles out. I climbed initially to 110, but then asked for higher and made 150 pretty quickly as well. The tailwind was about 40 knots, then 50 once I climbed to 170. The weather was nice the entire way, a possibility suggested by the satellite photo. The engine was running very well, never a blip on the monitor. The fuel computer was indicating I could make it to Houston, and my weather down link began to work about 1000 miles from California. I could see it was now clear in Houston, spot checked the NEXRAD for the whole route, and decided to refile for Houston instead of Tucson. When I said I wanted a new destination, they were a bit surprised I wanted to go further than planned. Three hours into the trip. Range doesn't include distance covered. The values changed quite a bit, but I averaged 180, and arrived with 33 confirmed USG. The fuel planning page shows the current location and intended destination. 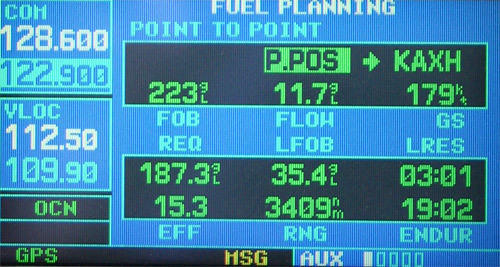 The FOB is fuel on board, flow is the current rate of consumption, GS is the groundspeed, REQ is the amount of fuel needed to reach the destination, LFOB is fuel left on board at destination, LRES is fuel remaining in time, EFF is nautical MPG, RNG is range in miles at current location, and ENDUR is total fuel remaining in hours and minutes. At the time this was taken, I have been flying 3 hours and nearly 600 miles. The sun went down about 300 miles from the west coast, and soon I could see the lights of Los Angeles and San Diego. When I talked to SoCal, they had lots of questions for me, but it was very pleasant, it kept me company. I unfortunately encountered a cross wind of up to 40 knots across all of southern California which really slowed me down, but the fuel looked OK. Another plus was music- I had new static wicks installed in Hawaii, and all kinds of noise went away. It was relaxing as well. I was handed over to Albuquerque Center, and a most pleasant controller there kept me company for almost two hours. Some other traffic broke in with occasional questions, most having to do with flying from Hawaii to Houston, and then about the trip over all. Once again, it was pleasant and entertaining, helping keep me awake and cheerful. I still had plenty of cokes, had even eaten an energy bar. No short final picture, it was dark. I reached Texas, and it stretched on forever, seemingly. Eventually, I saw the lights of Austin and San Antonio. I had sore ears, having switched back and forth between DCs and Bose until neither gave any relief. My nose was quite tired of the cannula. I was coming up on descent, and tried to organize things. I called my wife and said I would be there in 45 minutes. The tailwind had picked up to 30, and I headed down, seeing groundspeeds of 220. I was stepped down to 2000, and vectored to my airport for a visual approach. I entered downwind for 27. The winds were 25 knots from the north at 500 feet and I had burned out my landing light, leaving it on out of Hilo. The runway has medium intensity lights, and I made the worst landing of my trip, (mainly because I had been incredibly lucky the last five weeks) but after a bounce and a short taxi, I was in front of my hangar, where Claire waited in the car. She had warm clothes for me, it was 1 C out, and I was dressed in shorts, Hawaiian shirt, and sandals. After putting the plane in, I checked the flight timer, and it read 18 hours, 48 minutes. I had left at 6:25 am Hawaii time, and landed at 5:13 am Houston time, flying about 3350 miles. I went home and slept a little, but was restless. I went back to the airport a little later, and checked the fuel- 33 gallons left. The oil was at 10.5 quarts, I left with 11. I had flown a total of 170 hours around the world.